Description: Zippered closure. Tech Trap elastic interior organizer. Holds an iPad. Front cover access pocket with business card holders and media organizers. 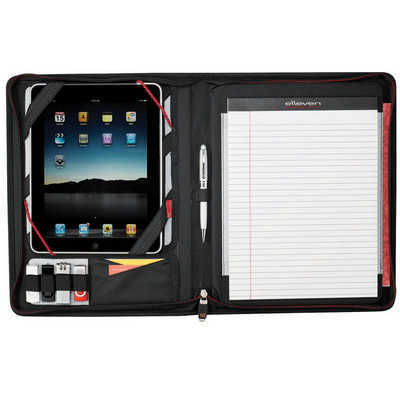 (Pens, iPad and other devices shown are not included) Features: Made from Dot Dobby Nylon with Scuba material. Includes 4 USB memory flash drive holders. 2 business card holders. Elastic pen loop. Gusseted document pocket and 21.6cm x 28cm Elleven series writing pad. Check out our Tablet Compatibility chart to see which tablets fit in the product. Packaging: In a plain black tuck box sitting in a polybag. Packaging Size: 360mm(h) x 289mm(w) x 41mm(d). Colour: Black. Material: Dot Dobby nylon Product Size: 355mm(h) x 279mm(w) x 48mm(d). Freight details : 12 per carton, 12.9kgs, 54.5 x 30 x 37.5cms; Decoration Type(s): Colour Print / Deboss / Debossed Foil / Foil Stamp / Full Colour Print. Decoration Area: Screen: 130mm x 130mm - On front pocket. Price includes : 1 Colour Print. Setup is included. Copyright © 2017. adzimpact. All rights reserved.